It's not what you think!! There is a gorgeous knitting pattern called Milo, by TikkiKnits. I just had to make one this year, for the most-beautiful-baby-in-the-world, my 6 month old Nephew. It was another challenge to meet, as it involves knitting-in-the-round, which I'm not very good at. A few other projects have been attempted and discarded, and there is still a not-yet-pair of socks waiting to be finished. I need to summon up the courage. How funny, to require courage to return to a knitting project! 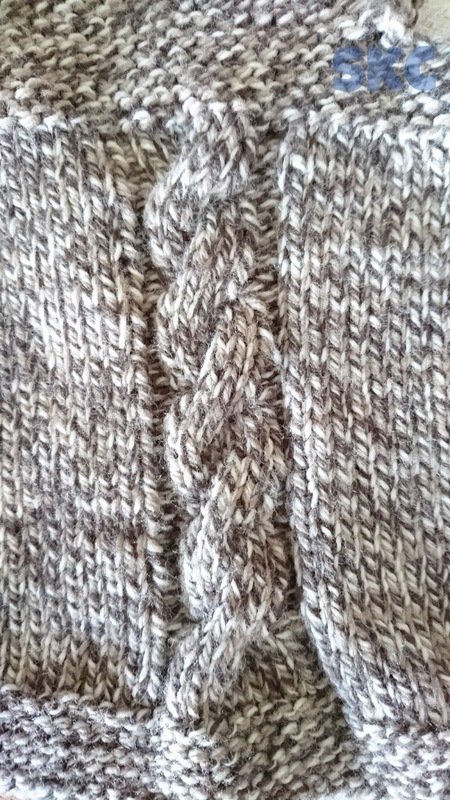 Despite a bit of a bumpy start, I persevered, and have really enjoyed knitting this lovely vest. The yarn is a Sirdar Toddler Yarn, which is just lovely and so soft. I dutifully did my tension square with an 8ply wool I was planning on using, but my tension was all wrong, and I didn't like the wool - it was a crepe that kept splitting. So I was lucky enough to have this yarn, gifted to me by a beautiful friend, left over from a jumper Gramma knitted for the dude. It's supposed to be an Aran (10 ply), but we think it's not quite that bulky. So I thought it would do for this project very nicely. Once again, I knitted my tension square, to check. 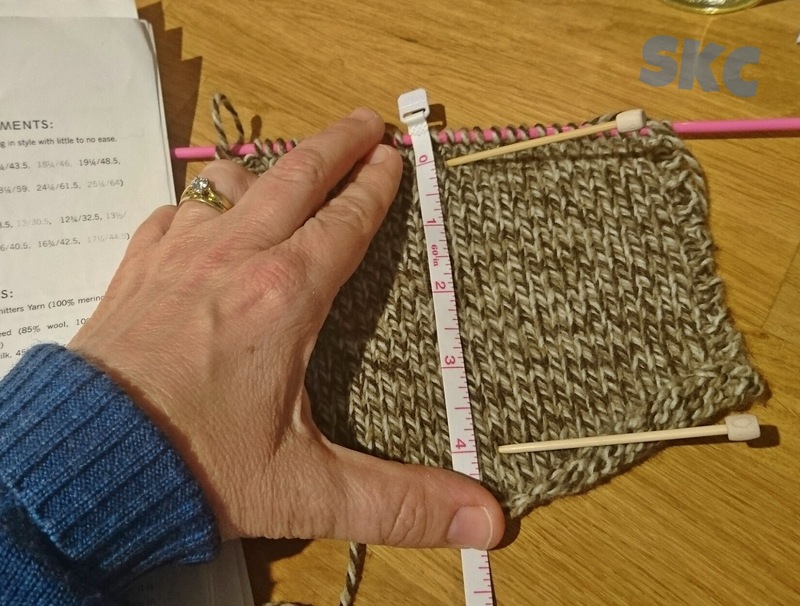 Just in case you've never done that, I thought I'd show you how to check the tension instructions in your pattern against the tension you actually knit. 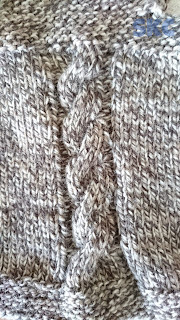 It really matters most for knitting garments because if the tension is wrong, all the sizing & proportions will be out, and you won't be able to join the pieces properly. For something like a cowl, scarf or shawl, it's not such a big deal unless the stitch you are using has a particular effect. So I personally wouldn't bother doing a tension square for those. These are the tension instructions from the pattern. Every pattern should have this information. First off, a confession. I couldn't be bothered knitting an in-the-round tension square (cylinder?) as I was too lazy. That will come as no surprise... So I just stuck with my usual square. And I only did the stocking stitch square. And, another confession. In photographing & re-counting the tension for you, I discovered it was actually out a little. Which would explain why the vest seemed a little wide for the length of it. Oh well. Nephew will grow into it. I must have mis-counted, or disregarded. At least you can learn from the error of my ways. This is what you are measuring to work out "stitches per 4 inches". It's nigh on impossible for you to count with the variegated wool, but it came out at 20 - count the 'v's. It should have been 22. In a bigger garment this would have caused problems. This is how you check the "rounds" (or, more commonly, "rows"). In this pattern it should have been 30 rounds, ie. 30 of the 'v's, but I think this was more like 28 - it was really hard to tell because of the variegation. If your tension is too tight (i.e. 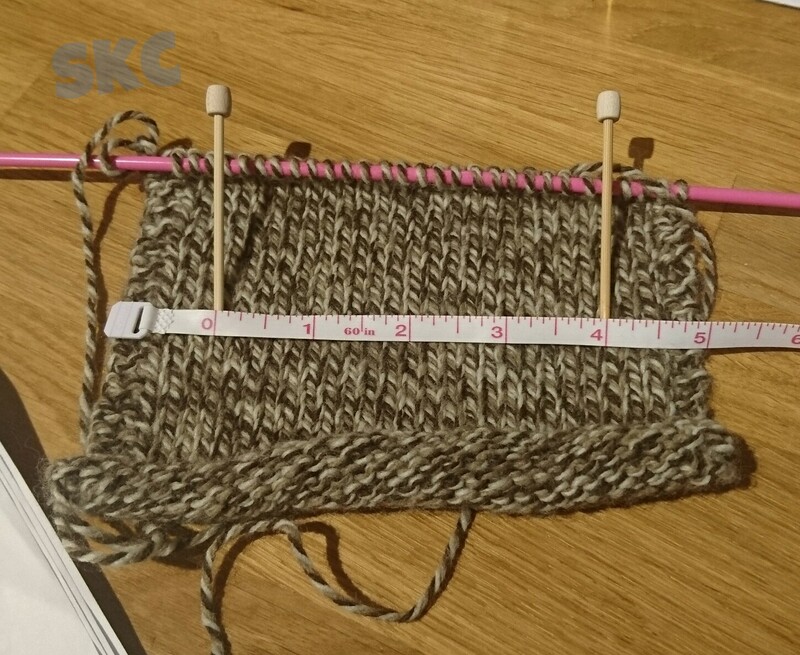 there are too many stitches/rows to the measurement) then you can increase your needle size a little. If your tension is too large (ie. not enough stitches / rows to the measurement) then you can either decrease your needle size or use a chunkier wool. I haven't got a lot to tell you about this project, except that I love it. Because it was knit in the round, there were no seams to do at the end. Also, the hem at the bottom is flaring just the tiniest bit, so next time I would follow the suggestion of going down a needle size for that. Garter stitch is a lovely stretchy stitch anyway. 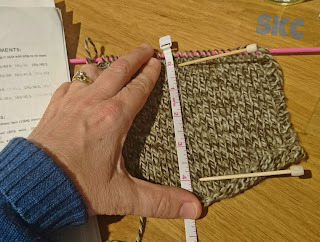 Had I knitted the garter stitch tension square as I should have, I would have realised that I needed to use a smaller needle for the garter stitch sections - the pattern did discuss this, but I didn't bother. I love how the shaping of the shoulder straps was done by increasing the stitches, not by seaming separate pieces. Doesn't it look awesome. Those straps are created by increases, the neckline is where the cast-on was. How cool is that! And the cast-off was also new to me, a 'decrease cast off' - I love how it looks. It's also got a bit more give in it than my usual cast off. Oh and it was a chance to have a go at knitting a cable, without it being a complex project. I have dim memories of attempting cables in my youth, but that is a Very. Long. Time. Ago now, and so I have no idea!! Don't you just think of teddy bears. I can't wait to cuddle Nephew wearing it :D.
Dude tried it on. I think we may have stretched it. Oops. Will wash back to size I'm sure. I think I'll be knitting one for the Dude shortly, as it was fairly quick to knit, and he's keen. He's also not keen about the whole need for sleeves because it's Winter thing. 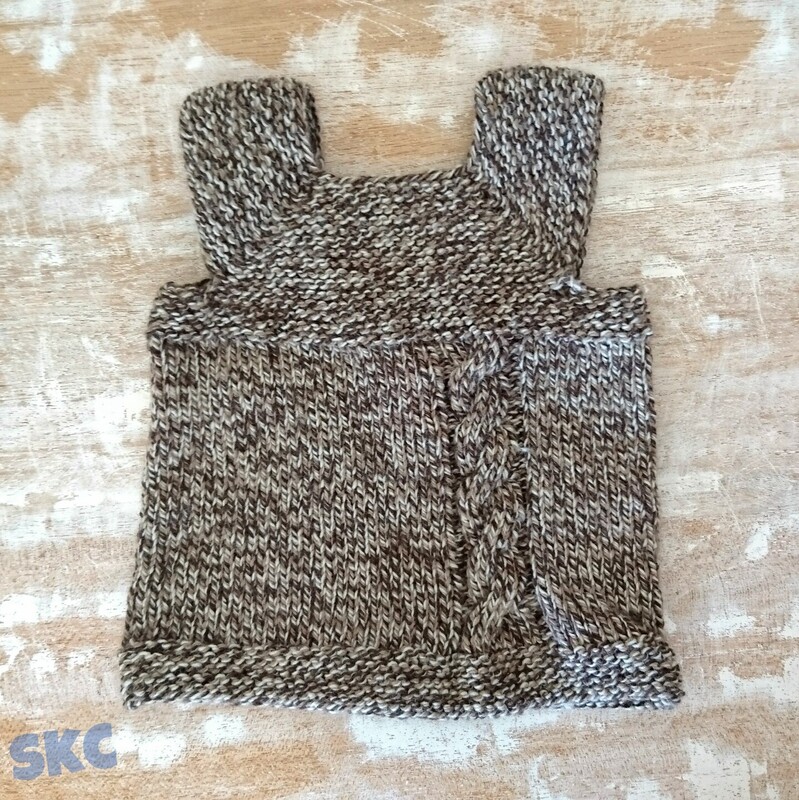 This vest was designed by TikkiKnits to keep kids warm without their needing lots of bulk. Brilliant. and Milo in May? Well, I didn't finish mine in May (although I finished much sooner than I expected to) but there are all sorts of awesome knitters who take part in a competition on Ravelry. One amazing person even knitted 8 Milos, in May. These were no ordinary Milos either. There were Dragons! Dragons! Go check out the creations, here. My favourite was the Bear & Mountain design. I'm thinking I'll need to figure that pattern out. I also have a chart for a Snowy Mountains theme that could also look fabulous. And wintry. And I do like Wintry. This is an awesome pattern, I recommend it to everyone! !